Today we welcome Jasmine from The Globe on Wheels to the traveling conversation! My love of ancient cultures and civilizations began when I took a Greek and Roman mythology course as an elective for one of the programs I was studying at the time. As soon as I finished that program, I applied to my local university and was accepted into the Classics program. At the beginning of my third year of studying both ancient cultures and their corresponding languages, I knew I had to make my way at least to Italy. I began planning my first trip outside of North America. It wasn’t as straightforward as booking some flights and hotels. I had to thoroughly plan a wheelchair accessible vacation. 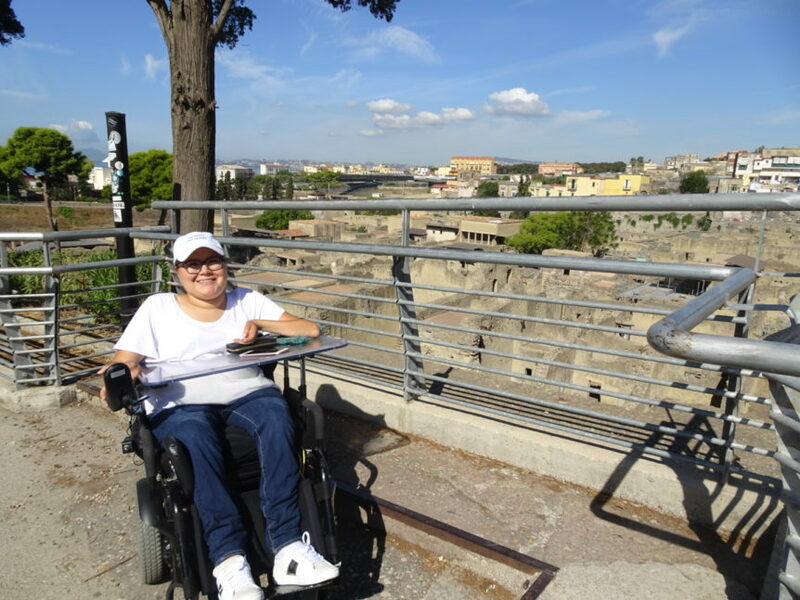 That included a hotel that has all the accessible features I require, one that is in a good location, which archaeological sites were wheelchair accessible and which were not, a flight that had the fewest connections and enough time between each one. There was a lot of research, but in the end every hour was well worth it. I saw all the major attractions that were on my list and then some. I got to see where the gladiators fought in the Colosseum, where people conducted their business 2,000 years ago in the Roman Forum, where Christianity replaced pagan gods in the Pantheon, where Michelangelo sculpted his famous David in Florence, even where an entire city was tragically covered by volcanic ash and preserved for today’s tourists to view in Pompeii, and so much more. On the whole, Italy was much more accessible than I had imagined. Public attractions offer free admission to wheelchair users and one additional person. Almost every major attraction is equipped with ramps, elevators, and stair lifts. Sure, the cobblestones are not that pleasant to wheel over, but it gives you more time to soak up all the amazing sights surrounding you. After my first trip to Italy, I felt as if I had only seen a glimpse of that beautiful country. A year later, I started planning my second trip to Italy. This time I was a little more daring and ended up squeezing in four Italian cities to visit in about two and a half weeks. I started in Venice and eventually made my way back to Rome after feasting my eyes on the Leaning Tower in Pisa and rolling around Herculaneum, which was affected by the same volcanic eruption as Pompeii. During the planning stages of each trip, I experienced some hurdles, but I am so glad I persisted because now I have some wonderful memories that will last a lifetime.